We all naturally pull away from things that are coded as disgusting, unhygienic, or rotten – and for a very good reason. Considering that these dirty situations or environments usually result in the perfect breeding ground for pests, diseases, and bacteria, it is easy to see why such an aversion has been hardcoded into us over the course of evolution. That said, some of us may admit that we secretly (or openly) have a morbid fascination with just how bad some things can get. There is something to be said about the disbelief you can’t help but feel when you look at these videos and pictures. Often, you probably just ended up sitting there and wonder, how on earth did the folks involve let this situation get so bad? 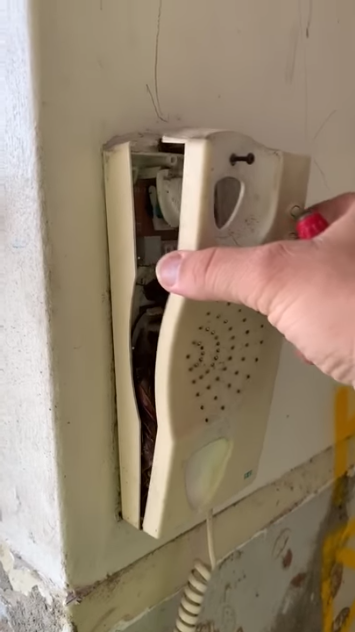 That was probably what this Australian man had thought when cracked open and unused landline and discovered the horrifying secret that laid within. Recently, a video has been going viral on multiple social media platforms, including Facebook and YouTube. The video itself and its descriptions didn’t reveal much context – all viewers know is that an unnamed man was working on a house in Sydney when he came across an unused landline. 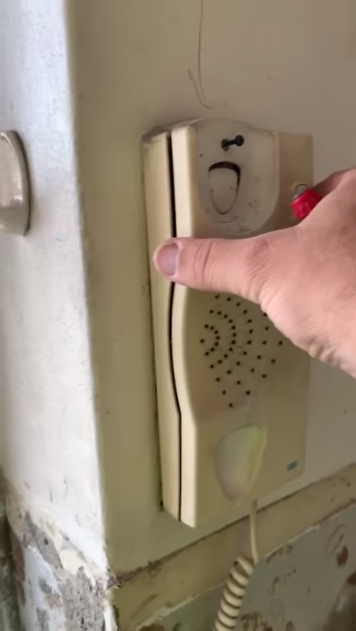 It is presumed that he was working on fixing up the property, as according to the video descriptions he had decided to check in on the landline’s usability upon commenting on how dirty and untouched it was. He had assumed it wasn’t working, based on its physical appearance – a safe assumption to make, in this day and age where cellphones and smartphones are owned by just about anyone. A quick attempt at dialling someone easily revealed that the phone, as per his suspicions, was presently non-functional. The next step for this man was to obviously crack the wall-mounted phone’s plastic case open to see what needed fixing inside. He proceeded to take a video of the process, which turned out to be a great idea since no one would have otherwise believed what happened next. As soon as he pulled free the yellowed casing, an entire pile of dead cockroaches spilled out from behind it! 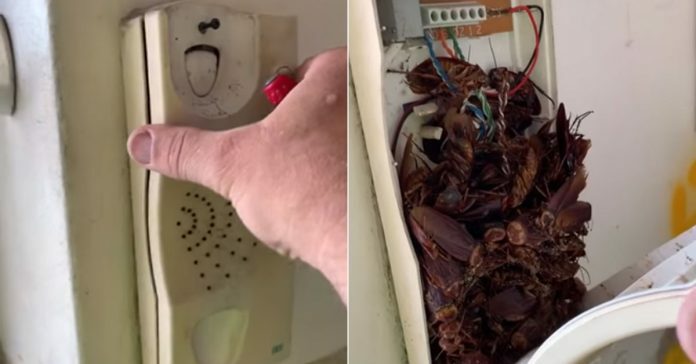 For reasons yet unknown, it seems that dozens of cockroaches had crammed themselves into the spaces between the wiring in the phone, where they had proceeded to stay until they died. As you can imagine, the responses from viewers have been largely predictable, with many of them being horrified and disgusted at the view. Some find solace in the fact that each and every single one of these massive cockroaches is dead, but it is a small relief. One YouTube commenter recalls an old science class experiment, and suggests they may have the answer for such a peculiar infestation location. 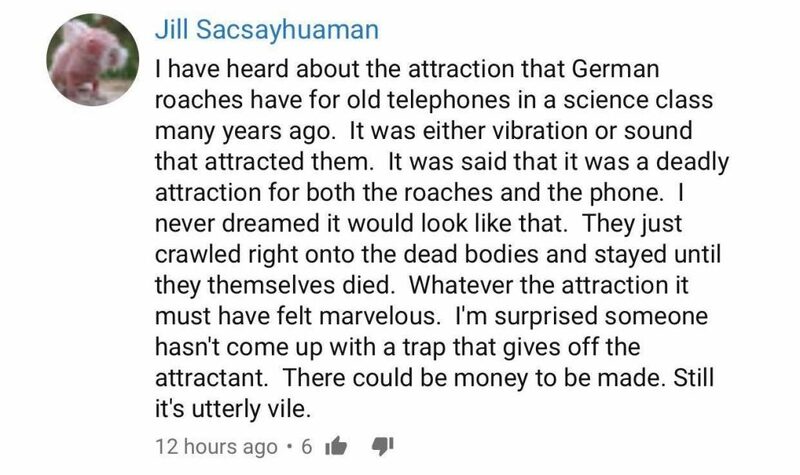 Supposedly, the vibration or the sound from old telephones is irresistible to German cockroaches, who would crawl into the phone and stay there, to the detriment of both the roaches and the phone itself. Whether this is truly the answer or not, this phone is clearly a better pest trap than actual commercially available traps out there!